Sometimes I can barely tell if I’m awake or sleeping. I’m in my loft bed in the house I grew up in. Fourteen years old. Too old for what seems to be happening: I have once again half-surfaced from sleep into a riptide pulling me toward one of my nightmares. The house is dark and mostly empty. My brother is gone, off to boarding school for the second year in a row, and for some reason my mother is gone too. I don’t know where she is. Within a few years she’ll leave the house for good. I’ll leave too. Everyone will leave, going separate ways. Tom will be the last one, my stepfather. He is the only one except for me in the house right now, my nightmare taking hold. They’ve been happening for years. They started when we moved to Vermont, away from my father. Sometimes I have sought help when I can feel one coming on, but no one has ever known what to do. Once, when my brother and I were in the house alone, he saw the look on my face and started reading to me from one of his Star Trek novelizations. His voice uttering names from the painless world of television, Spock, Kirk, Chekhov, McCoy, somehow it calmed me. But that time I was only just verging on the first unstoppable feelings of the nightmare (or night terror, as I later learn it is called). And other than that, nothing has ever helped. I always end up terrified. Every wall, every chair, every inch of everything looking wrong, so wrong I run through the house screaming. But on this night as my heart starts to pound and the walls begin to bend away from me, I go into the room where the only other person left in the house is sleeping. I’ll remember for the rest of my life what happens. Tom acts instinctively, barely awake, eyes wide, startled. I’ve come close enough for him to reach out, and he does. He holds my hand, strokes it, speaks softly. My heartbeat slows. My breathing gets deeper. Maybe this time I’ll be OK, I start thinking. Tom’s hands holding mine. Five years earlier, while my brother and I are visiting our dad at his apartment on 11th Street and Broadway, the lights go out all over the city. To us this is a thing of wonder. By then my dad has been living apart from us for three years. He is becoming a stranger. Maybe to avoid feeling this estrangement, we go to a lot of movies. We see movies almost every day, once in a while going from one movie to the next. Disaster movies are big. The Towering Inferno. Earthquake. When the lights go out the idea dawns: Maybe we’ve landed in a disaster movie! The lights are out for a long time. Maybe they’ll be off forever! We go to Central Park and are interviewed by a Times reporter doing a story on kids during the blackout. I tell the reporter that now my dad won’t have to yell at my brother anymore to turn off the bathroom light. We get the paper the next day, see our names, see my quote. We aren’t three strangers anymore, but a family inside an adventure! The next day Times Square gets power and to escape the sweltering heat we go to an air-conditioned double-feature in wondrous Sensurround: Midway and Rollercoaster. For hours every time a bomb explodes or a roller coaster roars the Sensurround-rigged seats shake. When it’s over we stumble into the street, blinking in the sunlight, our legs trembling. By the next day the power has come back all over the city. We go to Shea for a doubleheader. The young man pictured in the 1979 card above bats third in the opener, and for reasons that are mostly obscure to me now he instantly becomes my most favorite player on my most favorite team in the alternate universe of our short visits to New York. Somehow I must have gleaned that Steve Henderson is the future of the Mets, their brightest young star, and I latch onto him. He is known at this time as “Stevie Wonder.” In 1977 I know, dimly, who the actual Stevie Wonder is, but I mostly ignore that association. Instead, Steve Henderson’s nickname conjures images of a superhero, a magic man, someone capable of turning the usual boredom of life fantastic. The baffled look on his face in his 1979 card seems to suggest the days of wonder have begun to come to an end for Steve Henderson. 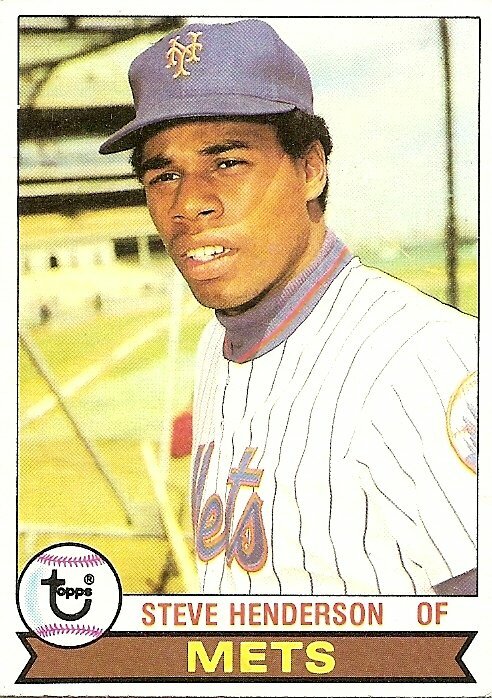 He had followed his promising debut season of 1977, where he finished second in the Rookie of the Year voting to Andre Dawson, with a decent but unspectacular sophomore campaign that would turn out to be the norm for the itinerant years to come. Stardom never arrived. Worse, the connection between him and the word “Wonder” seems to have vanished: no nickname is listed at his page on baseball-reference.com. But I remember Stevie Wonder. I also remember the day before I discovered Stevie Wonder. It was the evening following our afternoon in Sensurround. The electricity was still out in my dad’s neighborhood. We had to climb the six flights up to his apartment. No elevator. No lights in the stairway. We held on to one another going up. That’s how I remember it anyway, the wonder of it, my brother, my father, and me hand in hand, rising through the dark. I keep drifting backwards. Now I’m four years old. A couple years earlier my mother met a man on a bus to a peace march. They fell in love. Eventually, my father was told. Divorce loomed, but the three adults agreed to instead experiment with a new kind of family. Why not try for more love, not less? It’s 1972. Many are experimenting. Many are trying for more love, not less. We move to a bigger house and a man with long hair and a long beard joins us. Tom. Tom shares a room with my mother, my father in the guest room down the hall. In later years I’ll come to learn how unusual this is. I’ll also decide that as a small child I probably sponged up, as only a small child can, many of the unsaid tensions the unusual situation created. But at the time all I knew was that I had a mom and a dad and a brother and a Tom, and they all loved me. It was a golden age of sorts, all of us together for the first and last time. Within a couple years it would be over, and I would begin a life adrift, taking refuge in the Cardboard Gods. You are currently browsing the archives for the Steve Henderson category.